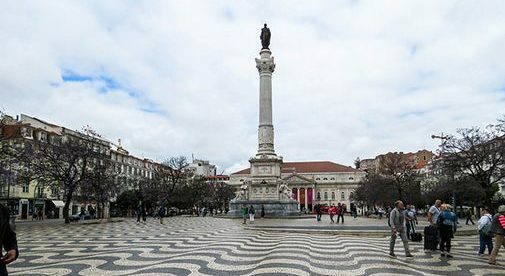 Rossio (officially called Praca Dom Pedro IV), in Lisbon, Portugal. When walking up the steep and narrow cobblestone streets of Lisbon, Portugal, I’m spoiled for choice. Look up and I see the beautiful tiles on the walls and the colorful clothes hanging from the windows; look down and I can glimpse the mosaic limestones on the sidewalks. This is now one of life’s everyday pleasures, but it wasn’t always that way. After some years living the corporate life and doing 12-hour shifts, I knew I needed a “plan B.” I loved being a marketing executive for a major technology company. But after over two decades of this hectic and competitive life, it was taking its toll, and I wanted to experience more from life. My plan was simple. As I am bilingual in English and Portuguese, I realized I could use my language skills to my advantage. Through some connections at a university in Lisbon I found some work as a translator and proofreader. I now live on the outskirts of Lisbon in an apartment surrounded by parks, just a five-minute drive from the beach and 10 minutes from Lisbon’s city center. The days are sunny all year round and especially long in the summer, begging you to stay outdoors and enjoy the unique sunlight. Meanwhile, my business keeps growing. Clients refer me to their colleagues through word of mouth. And I created a new service and started coaching academics for presentations in English. People in Portugal normally speak English well enough to get by and help tourists. But when it comes to producing academic texts and speaking to an English-speaking audience, they end up needing help. With time, I got referred to the departments of Business Management and Psychology at the university, ended up in their database, and now I have more than enough work to fill up my days. When I’m not working I like to take a walk near the river—where there are bikes to hire and many places to chill—read a book and indulge in an ice cream cone. I also enjoy going to Bairro Alto (a central district in Lisbon) to browse through the local designer shops where I can get clothes, decor objects for my house, or even ginger-scented homemade soap. If I’m in a museum mood, I go to Palácio Nacional da Ajuda to see how the Portuguese royalty lived in the 19th century. Living here is quite inexpensive and my lifestyle makes it even more so. I no longer need to have a dress attire for the office and can work in jeans and flip-flops every day. I can live very comfortably with my $2,500 monthly budget, including utilities, private health insurance, and many non-essentials, such as a gym membership and a car, as well as periodic trips around Portugal and Europe. I eat out often and with $10 I can have a hearty meal (enough for two people), including a glass of wine and espresso. With decent internet and plenty of cafés that welcome professionals such as myself, I usually rely on WiFi to work. Most cafés have decent WiFi, but for $20 a month I also have mobile internet for backup. My plan B works beautifully for me. I have the freedom to work at my own pace, and I get to do it in one of the most beautiful—and inexpensive—cities in Europe.